Watch How Excited This Adorable Pup Gets When It’s Time For A Walk! When you are a puppy who doesn’t really have much to do at home, your house can get pretty boring – no matter how many toys you have. Variety is the spice of life, after all, and boredom can be utterly horrible to most of us – including pups! 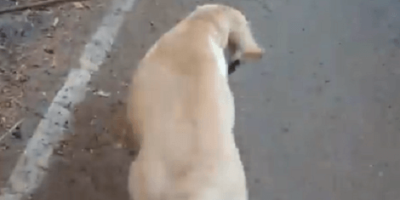 This is probably why this Labrador Retriever puppy is so excited to go out for a walk. He has learned by now that whenever the collar and the leash come out, it means that he can go and explore the world outside! Quite exciting for a puppy who is otherwise cooped out in the house all day, if you ask us! In fact, this adorable little fella is so excited, he can’t help but hop up and down first so he can get all that energy out of his system! As soon as Dad lets them out of the house and closes the gates behind them, it is off to the races. Hopefully, these two will have plenty of fun! Adorable Pup Finds A Comfy Spot So He Can Snuggle Up In The Blanket!